If so, first software I recommend is something called TuneUp by TuneUp Media. It is available for Mac and Windows and it takes your audio file and rescans it using the Gracenote database (that’s what iTunes uses when you import a CD for the first time). It takes about 5 minutes for 500 tracks, so you might be there for a while. There are three tiers of certainty: Matches, Likely Matches, and Not Found. This software can transform your terribly dirty music collection into a somewhat clean collection of music, but, as with any user-contributed database, the Gracenote database (the foundation of TuneUp), is not perfect, so only add Matches indiscriminately and take care of your choices when saving those Likely Matches (because they can be WAY off). So how do you prevent your music from looking like this in the first place? I’m pretty sure this says it all. If you import whole albums, you are less likely to lose a track, mislabel the track, etc. Every time you import an album, make sure you get album art with it, because it looks better, is more recognizable, and is logically grouped in a more visual way. If you follow Tip #3, you can fix most of the Album Art you already have. Yes, I am an iTunes Match user. Not only is it the best $24.99 a musician can spend in 1 year (yes, 1 year for $24.99), but you can also, if you are thinking about buying a new iPod, get a cheap one that has WiFi capabilities because it can stream your music to your iPod using iCloud. Simply, you can stream your 100 GB music collection on your 8GB iPod Touch (as long as you have WiFi) and also download as much of your library as your device can hold. There are two important tips relating to iTunes Match, but this first one is about fixing the audio quality of your music. If you create a special playlist, you can, after iCloud finishes analyzing your library, delete your music certain songs off your hard drive and redownload them at 256 kbps. My first iPod was a 2GB iPod Nano and I remember when I broke the 2GB threshold. I went into my entire collection and I shrunk it down from 128 kbps to 92 kbps. Then, when I got even more music, that 92 shrank to 64. By the time I obtained my Bose QuietComfort 15s, I had over 1/6 of my library in 64 kbps…which you can REALLY hear on the Bose (there is no pop in the bass drum or in the high-hat — no highs or lows -_- ). Unrelated, I purchased David Sanborn’s “Closer” physically and it has since been shattered due to circumstances of which I have no knowledge (and I was really upset that my CD broke when it was at 64 kbps and I couldn’t even reimport it…), so the fact that I could redownload it, along with all my other low quality music, cheered me up. Summary of this tip: get better sounding music because, the better headphones you get, the worse the music sounds. To fix your audio quality, check out this tutorial put together by wwwinsanelygreatmac, I’ll show it to you in my video at the end of the article. First and foremost, music tags are data that you see( like artist, track name and number, disk number, genre, etc.) and while the Gracenote database may be able to recognize your music without tags, you probably cannot (without listening, of course). If you use TuneUp before using iTunes Match, it will make iTunes Match that much more effective. I’m not totally sure if iTunes Match will work if your tags are dirty, but you are bound to have tracks that need to be cleaned or for which you need album art (or other info) and TuneUp is phenomenal for that. Clean up those tags for better organization! Redownloading your music from iTunes Match should be able to fix nearly all your tags and artwork in your library, but if your audio is above 256 kbps, you would lose quality by doing that, so it would be better to just fix the data…which you can do with TuneUp. I’m fairly confident that most people attain music through both legal and illegal methods such as trading music with a friend, downloading music off YouTube, ripping a CD from the library, etc, but you can legalize your music with iTunes Match. Note: this is not an implicating paragraph! Now, if you follow the procedures described in our article on Hard Drive Security, you can erase all traces (or nearly all) to the illegal data after you have deleted all that music and redownloaded it again through iTunes Match (remember that video in Tip #3?? )…as you should. Note, this is not endorsing piracy, although you know my views on Internet Piracy. So, LEGALIZE YOUR MUSIC, to avoid problems in the future…I don’t have to remind you that some record labels likes to sue for millions, right? If you have a semi-expansive music library, you probably have some duplicates. For $15, you can purchase a license to Doug Adams’s software, Dupin. I highly recommend this software because you can use multiple criterion to find duplicates (like if two tracks have the same name, time, and artist) and you can select which ones you want en masse (so you can keep the ones that are rated higher, have higher bitrate, higher playcount, etc. )…this is incredibly useful if you have a library of over 1000 songs. So far we have dealt with ways of cleaning and optimizing your music by Importing Whole Albums, Getting Album Artwork, augmenting the bitrate, fixing your music tags, legalizing your music library, and getting rid of those duplicate songs, but we haven’t dealt with optimizing music flow; tips 7 and 8 help you optimize your organization and flow. Now this may seem simple, but it’s really important. If you listen to certain songs, then use regular playlists, but if you need to optimize your listening and have a certain criteria for each of those playlists, then use smart playlists. In my iTunes library, I have smart playlists categorized into folders with three main categories: Genres, Players, and Stars (but that’s Tip #8). For example, if you want to be able to listen to your Recently Added or Not Recently Played music, set up some smart playlists. You can set up a smart playlist in the File Menu in iTunes and just try things out. If you have any problems, shoot me an email and I’ll try and help (my email is zach@zysys.org). Smart playlists and also Genius Mixes (which I classify as a type of Smart Playlist) can help you optimize your listening so you don’t get into any repetitive humps (which can be tough to avoid, especially if you have thousands upon thousands of songs and don’t know where to start listening). I would highly recommend creating some playlist folders (available in the File menu) which hold smart playlists of your favorite artists, different genres that you listen to (that could be different combos of genres like Neo-Country and Smooth Jazz, for example), and use ratings to your advantage. 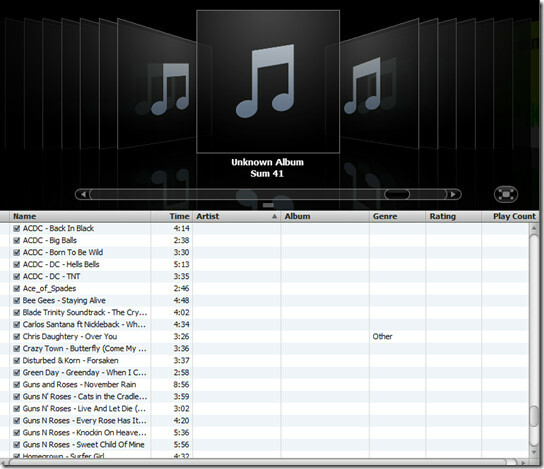 With iTunes Match, ratings transfer from your iPod/iPhone to your computer through the service, so your songs can be better classified. How do you manage your music? Do you have iTunes Match, Dupin, and/or TuneUp? Let me know in the comments!